The Okinawa Prefectural Government's divers investigate coral reef in a temporary restricted area in Oura Bay, Nago, at 10:34 a.m. on August 31. On the morning of August 31, the Okinawa Prefectural Government started a diving operation to investigate whether coral reef has been damaged in and around a temporary restricted area in Oura Bay, off the coast of Henoko, Nago. There, the Okinawa Defense Bureau is advancing preparations to build a new U.S. base to replace U.S. Marine Corps Air Station Futenma. In February, the prefectural government requested that the U.S. military and the government of Japan allow it to carry out a survey because concrete blocks installed by the defense bureau for a seabed drilling survey have damaged coral reef outside of the planned reclamation area for the new base. Fifteen officials of the prefectural government departed Teima Fishing Port at 9:30 a.m. on three ships. Four fishing boats employed by the Okinawa Defense Bureau left the same port at the same time. At 9:45 a.m., the prefectural government’s ships entered a temporary restricted area. The prefectural government’s divers began to investigate the seabed along floats on the Sedake-side at 9:55 a.m. 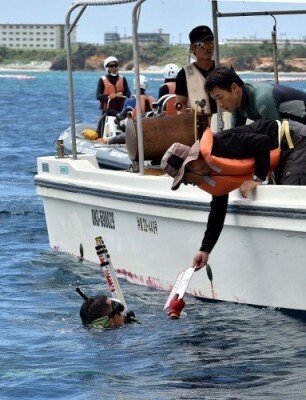 The defense bureau’s divers also jumped into the sea to monitor safety. In August, the governments of Japan and the United States approved the prefectural government’s request to conduct the survey in the restricted area in Oura Bay during intensive consultations between the prefectural and the central governments over the Henoko issue. The diving survey will take until at least September 12. The intensive consultations are scheduled to end on September 9.